Ooi, Z. X., Chan, K. L., Ewe, C. Y., Muniyadi, M., Teoh, Y. P., and Ismail, H. (2017). "Evaluation of water affinity and soil burial degradation of thermoplastic film derived from oil palm ash-filled polyvinyl alcohol," BioRes. 12(2), 4111-4122. Oil palm ash (OPA) produced through the incineration process were used as a blending material with polyvinyl alcohol (PVOH) to produce a thermoplastic film. Prior to blending, the oil palm ash was characterized using a scanning electron microscope (SEM), Fourier transform infrared spectroscopy, and x-ray diffraction (XRD). The OPA was successfully blended with polyvinyl alcohol to produce plastic films at various ratios of oil palm ash. 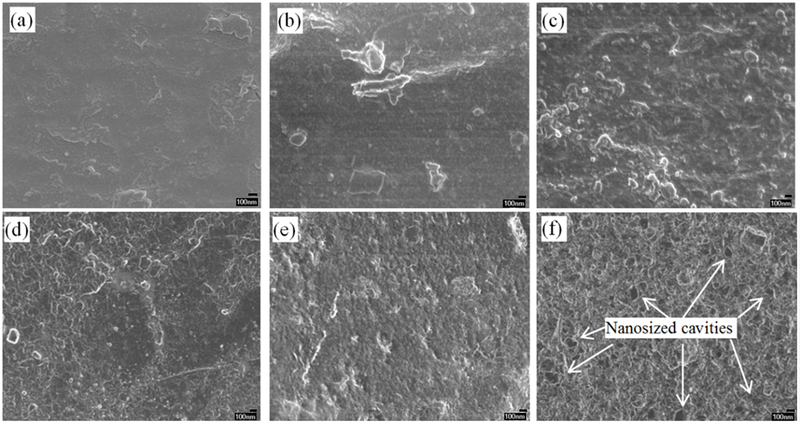 The properties of these blended polyvinyl alcohol/oil palm ash films were then characterized using SEM, water absorption, and soil burial tests. The water absorption decreased as the content of the oil palm ash increased. Blended polyvinyl alcohol/oil palm ash films showed a better degradation when the concentration of oil palm ash was increased. The packaging industry has been revolutionized throughout time with the introduction of petrochemical-based plastics, such as polyethylene (PE), polypropylene (PP), polystyrene (PS), poly (vinyl chloride) (PVC), poly (ethylene terephthalate) (PET), etc. According to the industrial directory of the Malaysian Plastic Manufacturers Association (JPSPN 2011), plastic industries play a significant role due to the millions of tons of plastic solid waste that has collected over the years (Bhatti 2010). Plastics are a type of material derived from polymers. They are composed of large molecules that are composed of small molecular units, also known as monomers. The process of joining these small molecules into a larger and longer molecule is known as polymerization. Plastics have become an essential part of life, and their consumption has been increased due to their desirable properties, light weight, and low cost (Lower 2009). However, the growth of the plastics industry has raised environmental problems due to the enormous amount of discarded plastics (Ismail and Ooi 2010; Zhong et al. 2011; Ooi et al. 2012; Castronuovo et al. 2015; Rajkumar 2015). This environmental problem has been a global concern. To overcome the issue, biodegradable polymers, e.g. polyvinyl alcohol (PVOH), polyurethanes, polycaprolactone (PCL), etc., have been introduced to produce plastics that can be biodegraded upon disposal. Many of the biodegradable plastics were produced by blending starch with PVOH, chitosan with PVOH, amongst others, to produce more eco-friendly plastics (Leja and Lewandowicz 2010; Ezeoha and Ezenwanne 2013). The compound PVOH is biocompatible and devoid of mutagenic and carcinogenic effects. Its widespread use is based on its low toxicity (LD50, 15 g/kg to 20 g/kg). The swell-ability, biocompatibility, and pH-responsiveness of PVOH are commonly used in drug delivery, contact lenses, artificial blood vessels, and skin products (Ali et al. 2014). Packaging plastics usually must meet specified demands for tensile and tear strengths, as well as oxygen, water, and aroma barrier properties. Such films possess a certain resistance to grease, oil, and solvent to meet the packaging requirements (Tan et al. 2015). The thermoplasticity of PVOH also allows for the use of a solution casting method to prepare the film (Ooi et al. 2011). It is suggested that adding natural fibers to PVOH can enhance biodegradability and cost reduction in conjunction with adhering to a green environmental policy. To the best of the authors’ knowledge, there has been no oil palm ash (OPA) blending reported to date. There is a massive amount of biomass waste produced annually by oil palm plantations. The ash results from the on-site processing of empty fruit brunches, oil palm fronds, mesocarp fiber, oil palm trunk, and palm kernel shell in boiler fuel by oil palm mill plantations to provide steam for electricity generation and oil palm extraction (Yin et al. 2008). Because agriculture constitutes a larger solid waste burden than polymers, compositing seems to be the right approach to this issue (Reddy 2016). Moreover, the disintegration of biodegradable packaging material used as agricultural mulch may decompose and become fertilizer and soil conditioner, which will facilitate better crop yield while allowing the dwindling petroleum resources to be preserved (Kasirajan and Ngouajio 2012). Therefore, in this project, PVOH and OPA were used to make plastic films. The effect of the various ratios of OPA that blended with the PVOH and its properties, such as water absorption and soil burial degradation will be investigated. The polymeric component of this study is poly (vinyl alcohol) (PVOH), 99+ % hydrolyzed supplied by Sigma-Aldrich (M) Sdn. Bhd (Petaling Jaya, Malaysia), product number 341584, and batch number #21897 LJ. The Chemical Abstract Service (CAS) registry number is 9002-89-5. The density of PVOH was 1.269 g/cm3, and it has a typical molecular weight of 89,000 g/mol to 98,000 g/mol. The melting point of PVOH was 200 °C, and it appeared in white powder form. The filler used to blend in the PVOH film was oil palm ash (OPA), which is considered waste and collected from the United Oil Palm Mill Industry Sdn. Bhd., located in Nibong Tebal, Penang. The OPA was sieved to < 63 μm particle size using a sieve shaker to separate the unburned oil palm biomass and was oven-dried at 80 °C for 24 h to remove moisture. The OPA powder was then kept in a desiccator for further use. The calculated amount of poly (vinyl alcohol) solution (10% w/v.) was prepared by dissolving PVOH in 100 mL deionized water in a 250-mL conical flask. Then it was heated on a hot plate stirrer with a magnetic bar via constant stirring at a temperature of 90 °C until the PVOH was fully dissolved. The time taken for the PVOH to fully dissolve was about 30 min. The OPA was then added to the conical flask and was continuously heated for another 2 h. The film was prepared using solution casting methods. Prior to casting, the cleaned glass plate was placed on a flat surface. Approximately 60 mL of mixture was then casted on the glass plate and dried overnight until it maintained a constant weight. The prepared unfilled PVOH film and OPA-filled PVOH film were then kept in a desiccator prior to any characterization. Table 1 shows the compositions of the PVOH/OPA films. The chemical bonding of OPA was characterized with a Fourier Transform Infrared (FTIR) spectrophotometer (Spectrum RX1, Perkin Elmer Corp., Norwalk, CT, USA) to get a better understanding on the interaction between PVOH and OPA. For OPA characterization, the KBr pellet method was used. The oil palm ash was well mixed with the KBr in a KBr:OPA ratio of 10:1, pulverized, and mixed using a mortar and pestle. The mixture was pressured on a pellet-forming die using a hydraulic press (ICL- International Crystal Laboratories, Garfield, NJ, USA). The formed pellet was oven-dried (model: Memmet, Schwabach, Germany) to remove any moisture. The spectrum was scanned within the 4000 cm-1 to 600 cm-1 range, with 16 scans, a 4.0 cm-1 resolution, a 1.0 cm-1 interval, and recorded in transmittance (%T). The morphology of OPA and PVOH/OPA blends were studied using a scanning electron microscope (SEM, JSM 6701-F, Jeol, Akishima, Japan) and conducted at an accelerating rate of 2.0 kV with 15000 and 20000x magnification at a working distance of 5.9 mm. The sample film was sputtered coated with a thin layer of platinum (thickness: 15 nm, density: 21.45 g/cm3) using a sputtering machine (JFC-1600, Jeol, Akishima, Japan) to avoid electrostatic charging and poor resolution during examination. The elemental analysis of OPA was determined using energy-dispersive x-ray spectroscopy (EDX) (X-Max, Oxford Instruments, Buckinghamshire, UK), which was equipped with SEM analysis and conducted at an accelerating rate of 2.0 kV with a 1000x magnification. 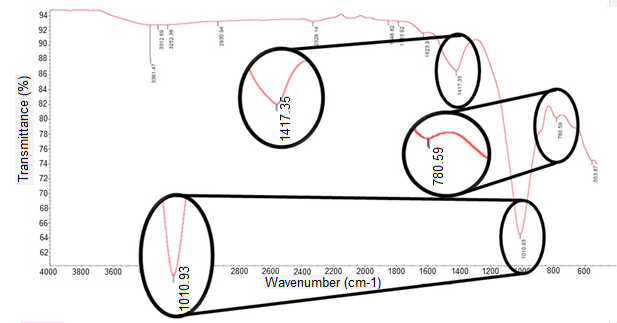 The refractive index of OPA was measured using a digital refractometer (300034, Sper Scientific Ltd., Scottsdale, AZ, USA), and then subjected to a particle size analyzer (Hydro 2000MU, Malvern Instrument Ltd., Malvern, UK). Water was used as a dispersant with a refractive index of 1.33. The particle size range was analyzed and plotted. The X-ray diffraction (XRD) patterns of OPA were recorded in the reflection mode of 10° to 70° at 2θ using X-ray diffraction (XRD-6000, Shimadzu, Kyoto, Japan). The mineralogy analysis of OPA was measured to elucidate the mineralogical composition in OPA particles. The soil burial test was used to examine the biodegradability of the films. The soil used was composted soil purchased from Success Superior Soil from Jaya Pot Enterprise (Kuala Langat, Malaysia). Different compositions of the films with and without the plasticizing agent (glycerol and urea) were prepared. There were 5 samples of each composition that were cut into dumbbell shape and were placed into 5 boxes with the same amount of soil. The same amount of water was added to the soil to maintain the moisture conditions for all of the samples. To measure the degradation of the samples, the initial weight of the samples was measured before placing into the soil. The samples were taken out from the soil each week for a period of 4 weeks, then were oven-dried at 60 °C for 5 min to remove the moisture. After that, the final weights of the samples were recorded. The weight of the samples was calculated using Eq. 2. The wi represents the initial weight of the samples before degradation (g), and wf represents the weight after the soil burial test (g). The weight loss of the samples was used to determine the percentage of degradation of the samples. Furthermore, the morphology of the sample films after the soil burial test will be examined using SEM. There has been no similar research reported on the blending of OPA into poly (vinyl alcohol) (PVOH) film in the past. Hence, the characterization of OPA was important to help in better understanding the interaction of OPA in a PVOH matrix. The characterization was conducted using Fourier Transform Infrared (FTIR) Spectroscopy, Scanning Electron Microscopy (SEM), Energy Dispersive X-Ray (EDX) Spectroscopy, Particle Size Analysis, and X-Ray Diffraction (XRD) Crystallography. Based on the FTIR spectrum shown in Fig. 1, there was a strong peak observed at 1010.9 cm-1. This was due to the silicon-oxygen (Si-O) groups alternating bound to the aluminum-oxygen (Al-O) group’s traits in the oil palm ash. There was also a neighboring weak peak that was at 780 cm-1. This peak was attributed to the Al-O and the Si-O-Al groups. The oxide forms of silicon and aluminum that were present in oil palm ash were later correlated with the EDX result. The peaks observed in the OPA’s FTIR spectrum were in agreement with literature reported by Foo and Hamed (2009) and Yin et al. (2008), which indicated that the Si-O alternating bound to Al-O and the Al-O or Si-O-Al peak appeared at 1050 cm-1 and 800 cm-1, respectively. The peak at 1417 cm-1 may have been due to the existence of calcium carbonate (Xu et al. 2001). Figure 2 shows the SEM micrograph of an oil palm ash particle. The oil palm ash particle showed spongy characteristics under 15000x magnification (Fig. 2a), while it clearly showed the porous structure when observed under 20000x magnification (Fig. 2b). This was in good agreement with observations reported by Yin et al. (2008) and Zarina et al. (2013). The molecular chains of PVOH can possibly adhere physically to the surface of OPA via the pores on OPA surface, which could induce stronger interfacial adhesion between PVC and OPA, and it could subsequently contribute to enhanced properties of PVOH/OPA blends. Based on Table 2, the carbon had the largest atomic weight compared to the other elements, which made up 48.54% of the OPA weight. The high organic content in OPA was due to its predominant cellulose nature. The high oxygen content, which was 44.28 wt.% could be postulated that most of the elements present in OPA existed predominately in the oxide form. 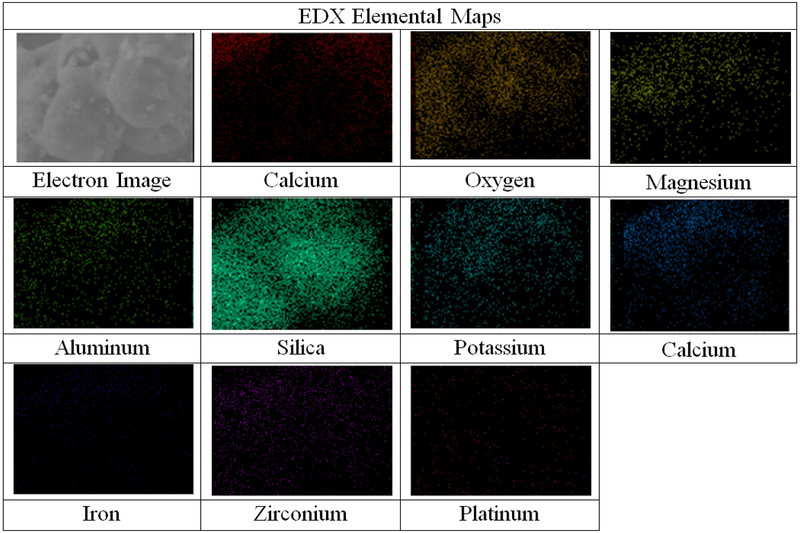 The silica element mapping shown in Fig. 3 depicts a vast majority of turquoise grains, and it was the most visible among all elements that were present. The refractive index of oil palm ash measured using the digital refractometer was 1.343. Figure 4 shows the OPA particle size distribution. 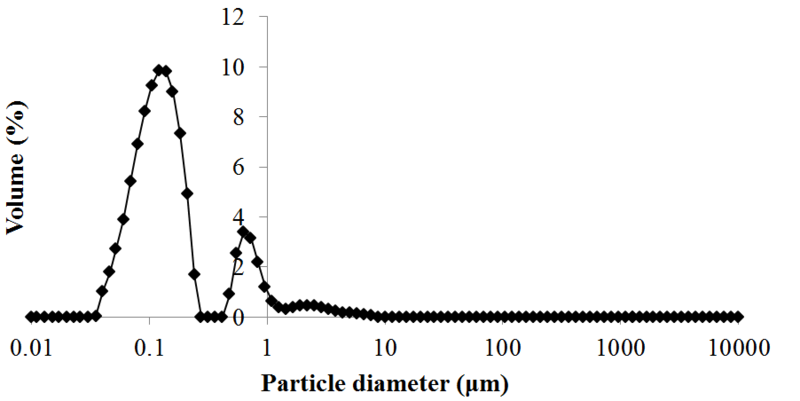 The particle size distribution shows a bimodal distribution and a uniformity of 1.7. The surface weighted mean, D [3, 2], and volume weighted mean, D [4, 3], were 0.126 μm and 0.332 μm, respectively. The bimodal distribution may have been due to the irregular rod shade of OPA, as shown in Fig. 2(a), and the varying inorganic elements of OPA. Figure 5(a) represents the XRD analysis plots of intensity of the minerals in OPA at the 2θ position, whereas Fig. 5(b) shows the mineralogical composition of OPA matched with the hexagonal silicon dioxide, SiO2 (COD 96-153-2513), and the hexagonal calcium carbonate (calcite), CaCO3 (COD 96-900-1298) database. The most prominent peak observed was silicon dioxide, SiO2, and calcium carbonate, CaCO3. The silicon dioxide matched with the database at 21.06o, 26.84o, 50.31o, and 60.15o, whereas the calcium carbonate matched with the database at 29.61o, 47.71o, and 48.68o values of 2θ, respectively. This result was in good agreement with Zarina et al. (2013), where they reported that more than 40% of silicon dioxide was found in oil palm ash. There were noises in the XRD analysis due to the complex nature of OPA because of its multilayered formation, such as vaporization, melting, crystallization, vitrification, condensation, and precipitation, that occurred during the combustion of oil palm waste (Yin et al. 2008; Ooi et al. 2014). The water absorption test was conducted on the different compositions of the polyvinyl alcohol/oil palm ash blended films. The water absorption was used to evaluate the water affinity of each composition. Figure 6 shows the water absorption of the different compositions of the blended films. The percentage of water uptake of blended films decreased when the content of the OPA was increased. The unfilled PVOH showed the highest percentage of water uptake (318.4%), and the PVOH/OPA (60/40) blended film showed the lowest percentage of water uptake (76.9%). It was already well-known that polyvinyl alcohol contains a hydroxyl group in its monomer structure and that polyvinyl alcohol is a water processing polymer (Hassan and Peppas 2000; Marin et al. 2014). Therefore, the unfilled PVOH film showed the highest percentage of water uptake. As the concentration of the oil palm ash increased, the hydroxyl groups in the polyvinyl alcohol reduced. The oil palm ash may have also have served as a barrier to restrict the water molecules that penetrated the blended polyvinyl alcohol/oil palm ash. Thus, PVOH/OPA (60/40) showed the lowest percentage of water absorption. 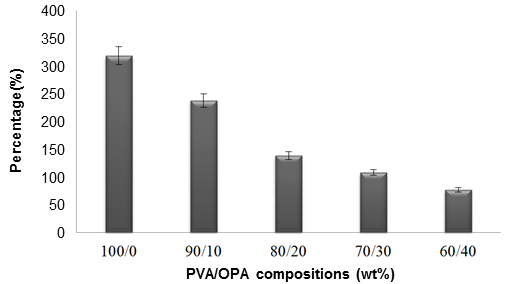 The degradability of PVOH/OPA film was investigated under compost soil burial conditions that provided a realistic environment where the temperature, humidity, pH, amount of microorganism, etc. were less controlled. 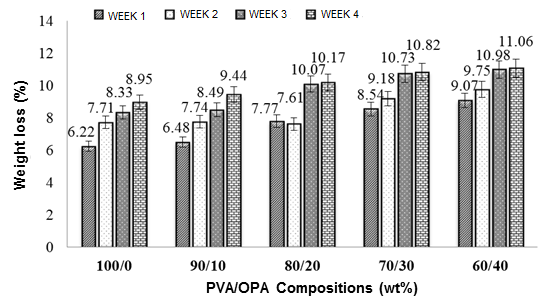 Figure 7 shows the weight loss of the PVOH/OPA film with respect to different OPA concentrations in the PVOH film over 4 weeks. The soil burial degradability showed a slight rise in the degradation rate when the OPA concentration was increased. The unfilled PVOH film showed the highest resistance toward degradation, whereas the PVOH/OPA 60/40 film showed the highest degradation rate. This may have been due to this fact that the C-C backbone linkage of the PVOH itself caused the low biodegradability (Ooi et al. 2011), whereas the PVOH/OPA 60/40 film could have been decomposed through aerobic decomposition as the film compost consisted largely of organic material, as evident in EDX analysis. The OPA contained potassium, calcium, magnesium, etc. that could have been applied as fertilizers to the growth of microbes (Udoetok 2012; Manullang and Rusmini 2015) and subsequently degraded the specimens. However, the overall degradation was not very considerable due to water’s inability to penetrate the matrix. This might imply that the degradation only happened on the surface of the blended films. Figure 8 shows the surface morphology of different compositions of PVOH/OPA blended film before and after they were subjected to the soil burial degradation test. The surface morphology after the soil burial degradation test appeared to be rougher and more brittle in unfilled PVOH films, whereas it appeared to be deteriorated and wrinkled in the PVOH/OPA 60/40 blended film. Also, nano-sized cavities were clearly observed on the PVOH/OPA 60/40 blended film (Fig. 8f). Moreover, there was also partial disappearance of the OPA observed (Figs. 8e and 8f) as compared to the surface morphology before the tests. This suggested that OPA may have been leached away during the soil burial degradation period due to the low bonding strength within the PVOH matrix. Thus, the increased weight loss of PVOH/OPA films might have been due to the leaching of OPA. From the results in this study, oil palm ash was characterized and used to blend with polyvinyl alcohol to produce a plastic film. The OPA exhibited an irregular and porous structure when viewed under SEM. There were various elements found in the oil palm ash such as silicon, potassium, calcium, magnesium, chlorine, iron, copper, and aluminum. When compared to the other inorganic elements in the oil palm ash, silicon contained the highest weight percentage. In the oil palm ash, silica was perhaps the most essential substance found, because silica was found at almost all major peaks through XRD. Moreover, the water absorption of the polyvinyl alcohol/oil palm ash blended films also decreased as the concentration of the oil palm ash increased. However, the biodegradability of the polyvinyl alcohol/oil palm ash blended films also increased as the concentration of oil palm ash increased. This work was financially supported by the University Tunku Abdul Rahman Research Fund (Project No. IPSR/RMC/UTARRF/2015-C2/O03). The authors would like to also acknowledge United Oil Palm Mill Industries Sdn Bhd. for providing the oil palm ash for this project. Bhatti, J. A. (2010). Current State and Potential for Increasing Plastics Recycling in the U.S., Master’s Thesis, Columbia University, New York City, NY. Ezeoha, S. L., and Ezenwanne, J. N. (2013). “Production of biodegradable plastic packaging film from cassava starch,” IOSR J. Eng. 3(10), 14-20. Hassan, C. M., and Peppas, N. A. (2000). “Structure and applications of poly (vinyl alcohol) hydrogels produced by conventional crosslinking or by freezing/thawing methods,” in: Biopolymers PVOH Hydrogels, Anionic Polymerisation Nanocomposites, Springer, Berlin-Heidelberg, Germany, pp. 37-65. Leja, K., and Lewandowicz, G. (2010). “Polymer biodegradation and biodegradable polymers—A review,” Pol. J. Environ. Stud. 19(2), 255-266. Lower, S. (2009). “Polymers and plastics: A chemical introduction,” (http://www.chem1.com/acad/webtext/states/polymers.html. ), Accessed 10 January 2017. Manullang, R. R., and Rusmini (2015). “Empty recemus of oil palm source of organic fertilizer with bio-activator on soybean plants,” Global J. Agr. Res. 3(2), 1-12. National Solid Waste Management Department (JPSPN) 2011. “A study on plastic. management in Peninsular Malaysia,” (http://jpspn.kpkt.gov.my/resources/index/ user_1/Sumber_Rujukan/kajian/JPSPN%20Plastic%20Study%20-%20Final%20Report%20GESB%20-%20Softcopy%20English%20Ed2.pdf. 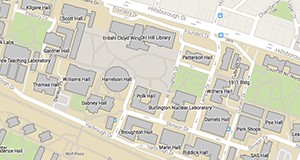 ), Accessed 14 June 2016. Ooi, Z. X., Ismail, H., Bakar, A. A., and Teoh, Y. P. (2014). “A review on recycling ash derived from Elaeis Guineensis by-product,” BioResources 9(4), 7926-7940. Reddy, P. J. (2016). Energy Recovery from Municipal Solid Waste by Thermal Conversion Technologies, CRC Press, London, UK, pp.138-148. Xu, G., Aksay, I., and Groves, J. (2001). “Continuous crystalline carbonate apatite thin films. A biomimetic approach,” J. Am. Chem. Soc. 123(10), 2196-2203. Zarina, Y., Mohd Mustafa Al Bakri, A., Kamarudin, H., Nizar, K., and Rafiza, A. R. (2013). “Review on the various ash from palm oil waste as geopolymer material,” Rev. Adv. Mater. Sci. 34, 37-43. Article submitted: January 19, 2017; Peer review completed: March 26, 2017; Revised version received and accepted: April 7, 2017; Published: April 24, 2017.